The Ghetto Fabulous Lady <福爾摩師奶> starring Adia Chan (陳松伶) is halfway through broadcast and various mysteries are slowly being unraveled. The most shocking may be the unveiling of Jeannie Chan‘s (陳瀅) character’s tragic past. 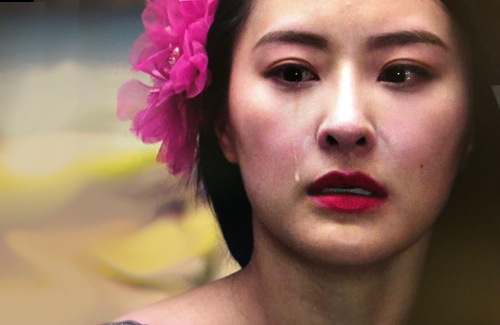 In the latest episode, Kaman Kong’s (江嘉敏) character starting to piece together memories of Adia’s husband Philip, and Ben Wong (黃智賢) discloses to Adia that Kaman is actually Philip’s daughter from his mistress. As well, Dickson Yu (余德丞) has successfully integrated into the upper echelons of society as a butler and he discovers that when Jeannie Chan (陳瀅) was held captive in Mr. Potter’s home but then rescued by a mysterious figure. The newest episode reveals that it was actually Gilbert Lam’s (林韋辰) character that rescued Jeannie from Mr. Potter. Gilbert rescued Jeannie as a child, and she remained by his side but their relationship took an unusual turn. She accidentally witnesses Gilbert’s wife having an affair with a foreigner and feels guilty. Thus, she allows Gilbert to take advantage of her, developing Stockholm Syndrome. Jeannie’s character was kept in a locked room where she was forced to provide sexual services for many years. Gilbert’s character appears to be kind, but he actually harbors deep resentment for foreigners. Mr. Potter is slated to be promoted to head of Home Bureau Affairs and Gilbert is insulted. Dickson also accidentally uncovers Gilbert’s relationship with Keith Ng’s (吳瑞庭) character. The episode ends with a mysterious person showing up to Adia’s living quarters claiming to be the real owner and asking for Alice Chan (陳煒) to hand over the land. Adia feels that the situation is suspicious and turns them away.